It was a good enough explanation but I was not satisfied with my work , there should be logical co-relation to life and mundane events and why something is assigned some particular characteristics and particular nakshtras or signs. “Ketu represents Introvert-ness, hiding one’s feelings and Introspection. It represents 'deep connections' as well as 'privacy' and 'isolation'. It represents detachments, losses and letting go of worldly connections, wishes and demands." Above were a a few lines from the chapter on Ketu from my book(before i edited it). KETU Actually represents the downwards lowest form of energy state. 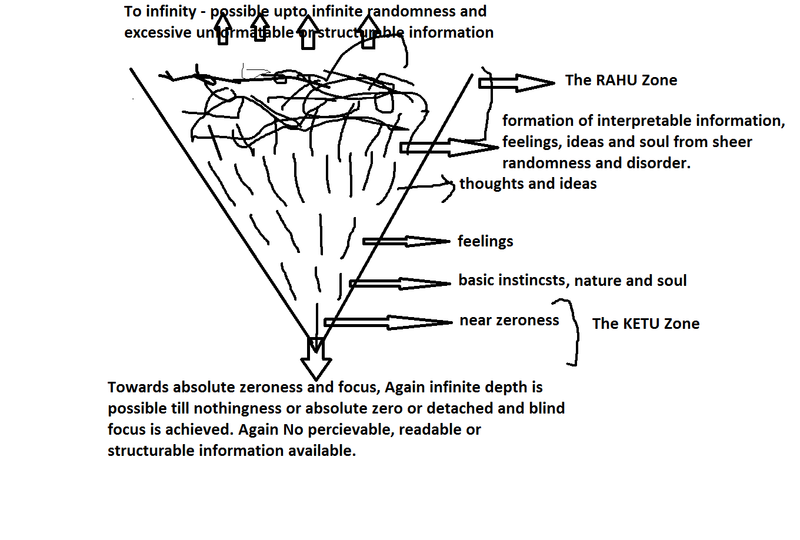 In the level Bar graph of Entropy or Randomness, Ketu represents the Zero or minimal entropy state. It can also represent a state where either there is no Entropy/Radomness at all or there is no change in the level of Entropy/randomness i.e there is a fixed level of Entropy. On a Kelvin Scale it represents ABSOLUTE ZERO temperature. It represents the state acquired after Giving off all energy, heat, randomness or acquisition and achieving Peace, Zero-ness, Immobility, Rigidity, focus and Stability. Anyhow this State is similar to Infinity or RAHU in 1 aspect. It has NO INFORMATION to interpret or observe by a regular Human being exists here. It is a No Information state. And by information I mean it is a state where nothing is happening( nothing of the regular physical world) and so nothing to observe. It is 'Moksha' or 'Zeroness' and liberation from worldly Order ( Devas) as well as Disorder ( Rahu). So NOW We start from here,, We start with BIRTH of Something out of Nothing. All we need is an Impulse or Energy that only has One direction to move into with focus, Enhancement and Impulse( The BIG BANG theory). Racing in one direction to give a START to create Observable and interpretable Phenomena which will be a Sort of ‘Information’ for us humans to Observe. 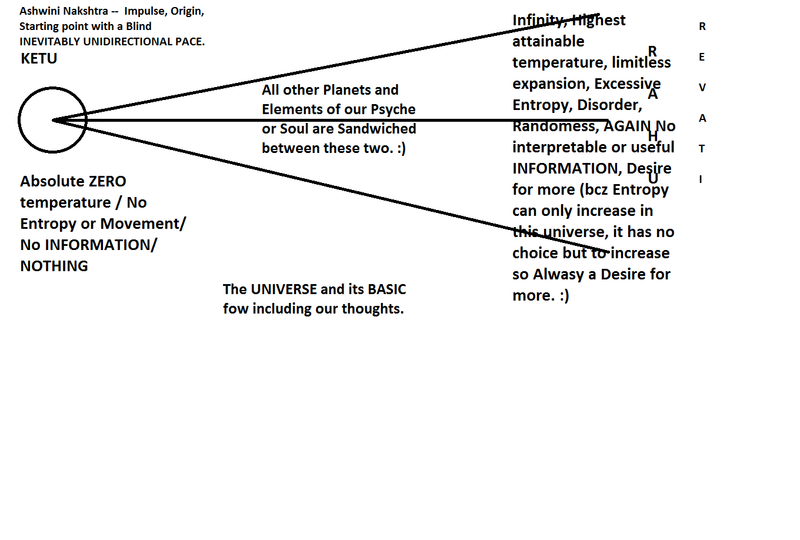 HEya.. Hello,, what do you see,,, Out of NOTHING,, we now have an Impulse, a creation, A Birth, A Randomness, A unidirectional , unstoppable RACE to Grow into multiple options and directions, after going through multiple levels as well as types of readable interpretable ‘information’ to ultimately reach massive deep empty expansion where again there is NO Interpretable ‘Information’ to be read. You all may be feeling ‘What is all this’. But if you re-read the Above text, I have Given you a small Glimpse on the ORIGIN of Astrology and EVERYTHING. I just explained to you What is KETU? Why is it the Zeroness and Nothingness/Moksha State and Also Why is it the Starting Point of everything? I just explained to you the CHARACTERISTICS of the ASHWINI Nakshatra. As we all know that the first Nakshtra is #Ashwini who is lorded by ketu and by reading the above lines you can understand that out of nothing or zero or fixed state come a blast of unidirectional focused energy to give a jump start to creation. Hence We have startings from Ketu + Ashwini + Aries + Mars. J How We move on with other signs and Nakshtras I will explain in later articles. Ketu can also be referred to a circle or a sphere which is complete and whole in itself and does not need any change or any addition or subtraction to improve or get better, it is already accomplished the best possible state and needs no change or variation. Any change will only cause imperfection. The Root of this Planet is:It is Rigid, fixed, Complete, a Whole in itself like a circle or sphere or a Zero, it is Stable, Self-assured and unidirectional in motion. It already knows everything, has lived everything, renounces everything and Meditates with focus and Stability in mind as well as mundane things. Saturn – Ketu: A Very focused and dedicated hard-working and Personality. Efforts are very focused and fruitful , no wastage of effort in useless and random activities. Stability , slowness and Minimum required efforts that are righteous and necessary for fruitification of events.